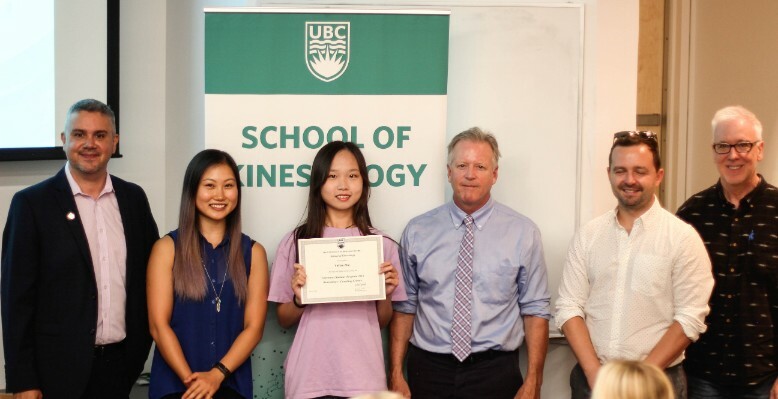 The Vancouver Summer Program (VSP) in Kinesiology was developed to provide students from several partner universities with a cross-cultural learning experience. 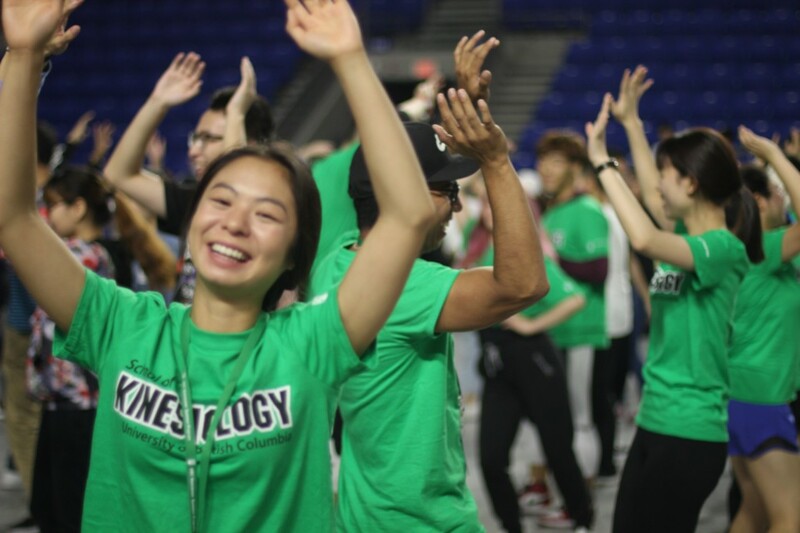 The program provides an opportunity for undergraduate students to learn about the field of Kinesiology in Canada, while also exploring Canadian society and culture through interactive lectures, various social activities and intercultural workshops. The VSP-KIN includes 3 packages, each with 2 courses of 39 hours of class time per course, and is equivalent to 6 credits. Classes are interactive and may include group work, class discussions, and guest lecturers. Credit for the courses will be granted by participating universities. Students enrolled in this package will explore the exercise-related concepts in classrooms, laboratories, and through field trips. Past participants visited the Richmond Oval, a world-class recreation facility and a 2010 Winter Olympic venue; BC Place, the host of the Opening and Closing Ceremonies of the Vancouver 2010 Olympic Winter Games and the venue for FIFA Women’s World Cup Canada 2015; and the Physical Activity Research Centre (PARC), an 11,000-square-metre, state-of-the-art research facility that brings together one of the most interdisciplinary Spinal Cord Injury research programs in the world. This theory-based course offers a practical overview of core topics and applications in sport and exercise psychology. The course is intended to develop students’ understanding of psychological factors that impact participation and performance in physical activity contexts. 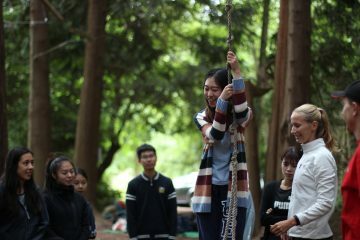 Students will have the opportunity to participate in group activities, apply knowledge to specific scenarios, and develop mental skills to demonstrate the application of psychological approaches. In particular, students are encouraged to reflect on how they can translate theoretical concepts and models into practice. Past guest lecturer for this class includes Matt Fisher, Head Strength and Conditioning Coach and part of the Integrated Support Team Lead for Canada Snowboard's National Freestyle Program for the 2010 Winter Olympics team. This theoretical and lab-based course will provide an overview of clinical exercise physiology. Diverse class activities include problem-based case studies, group projects, hands-on labs to examine cardio respiratory function, muscle function, and metabolism. The course will include visits to labs such as the world-renowned Physical Activity Research Centre (PARC) to facilitate an active learning environment. Upon completion of this course, students will develop an understanding of fundamental approaches to the assessment of physiological responses to exercise; altered responses in various clinical syndromes; and how exercise prescription and exercise monitoring is applied in clinical settings for health promotion. Students will also gain an appreciation of the influence of exercise and lifestyle on the prevention and treatment of chronic diseases. Students enrolled in this package will experience interactive learning from lectures followed by interactive practical sessions either outdoor or in the gymnasium. 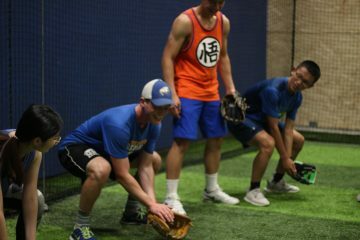 Past participants were taken on field trips to the UBC Doug Mitchell Thunderbird Sports Centre; the Richmond Oval, a world-class recreation facility and one of the 2010 Winter Olympic venues; and the UBC Baseball Indoor Training Centre, a $3.5-million-dollar state-of-the-art indoor training facility. This introductory course to coaching provides the foundation to become a successful coach. It will enable students to define who they are as coaches and will enhance their training and development skills with supplemental knowledge in strength and conditioning, nutrition, motor learning development, and performance planning. Practical outdoor sessions are offered in conjunction with the lectures to demonstrate core concepts in coaching. Upon completion of the course, students will be able to recognize the power inherent in coaching by creating their coaching philosophy and apply process to achieve it. They will learn how to recognize common sport injuries and provide a safe training and competition environment, how to use games for learning skills and building physical condition, and how to apply basic prophylactic and supportive taping systems. This course provides a broad overview of major topics in Sport Psychology for Coaching. 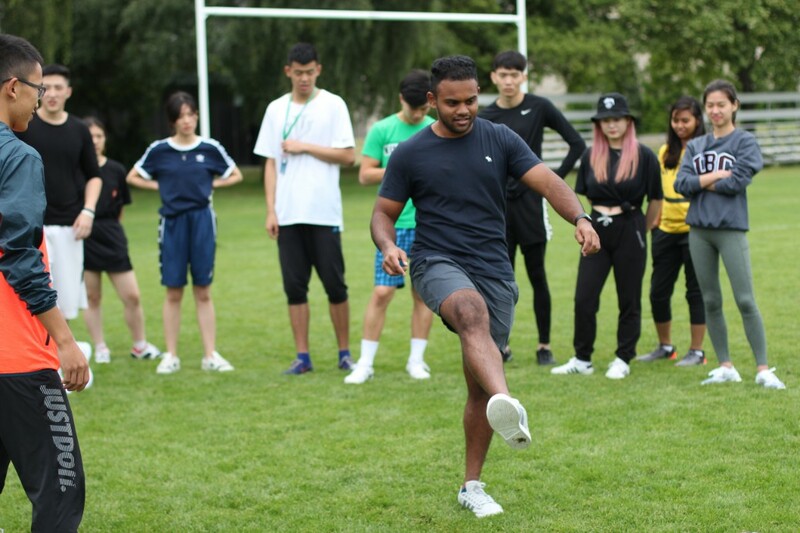 The student will develop an awareness of how sport and exercise psychology knowledge can be applied in coaching and understand the importance of the many mental aspects of coaching including group dynamics, motivation, leadership, coach-athlete relationships, and mental skill training. Complementary activities including outdoor games, tours at sport training centres, sport facilities, and research labs are designed to facilitate interactive learning. Exercise is now recognized as a fundamental lifestyle component of health promotion and is now an integral part of prescriptive approaches to the treatment of ~26 chronic diseases or conditions such as heart disease, lung disease, diabetes, cancer, dementia, and other degenerative diseases. Students enrolled in this package will be exposed to the theoretical basis for the mechanisms for exercise as a therapeutic approach to health promotion. Concepts learned in class will be supported by lab-based sessions covering testing and monitoring of exercise training programs. Participants will have the opportunity to visit the Physical Activity Research Centre (PARC), an 11,000-square-metre, state-of-the-art research facility that brings together one of the most interdisciplinary Spinal Cord Injury research programs in the world and the UBC Allan McGavin Sports Medicine Centre, one of only two FIFA Medical Centres of Excellence in Canada. This theoretical and lab-based course will provide an overview of clinical exercise physiology. 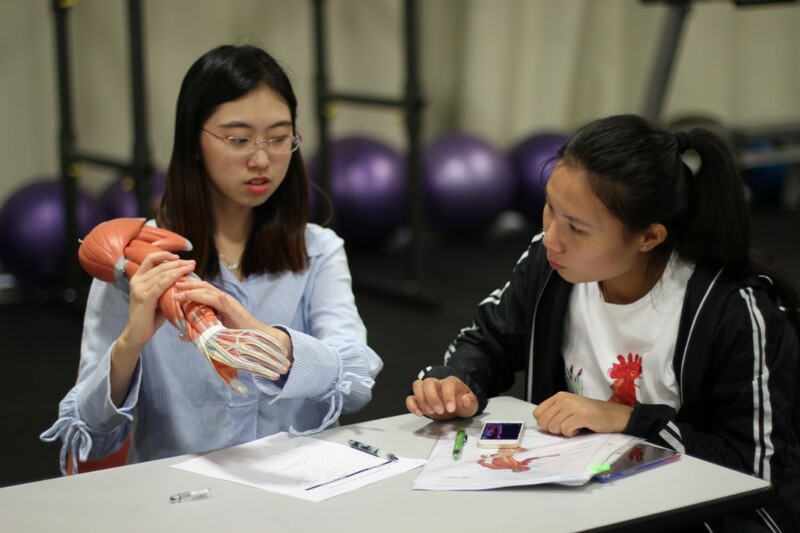 Diverse class activities include problem-based case studies, group projects, and hands-on labs to examine cardio respiratory function, muscle function, and metabolism. The course will include visits to labs such as the world-renowned Physical Activity Research Centre (PARC) to facilitate an active learning environment. Upon completion of this course, students will develop an understanding of fundamental approaches to the assessment of physiological responses to exercise; altered responses in various clinical syndromes; and how exercise prescription and exercise monitoring is applied in clinical settings for health promotion. Students will also gain an appreciation of the influence of exercise and lifestyle on the prevention and treatment of chronic diseases. This psychology-based course examines how engagement in health and physical activity behaviours affect health outcomes across the lifespan, and how individual engagement can be changed by intervention and health promotion strategies. Upon completion of the course, students will gain an understanding of models of behavioural change that promote health and physical activity behaviours. Students will also learn to apply these models towards intervention design, development, and evaluation to encourage adoption and maintenance of physical activity amongst special populations. The summer program will run for four weeks from July 13th to August 13th, 2019. This includes arrival and departure days. 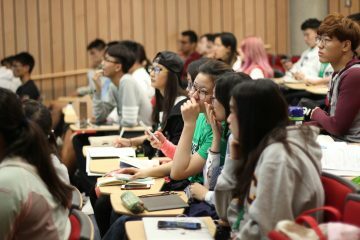 Students should arrive in Vancouver by July 13th. Orientation Day is set for Monday, July 15th, and classes will officially start on July 16th and finish on August 8th. Typical participants are undergraduate students who have completed a minimum of two years university prior to joining the program. Please note that students with less than two years university may be considered, if the homes institution approves it. Graduate students and professors are welcome to participate as well. 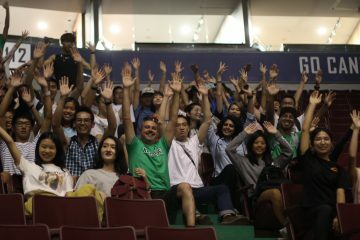 Students are supported by the School of Kinesiology staff and volunteers. Application and selection is made through the participating students’ home university. 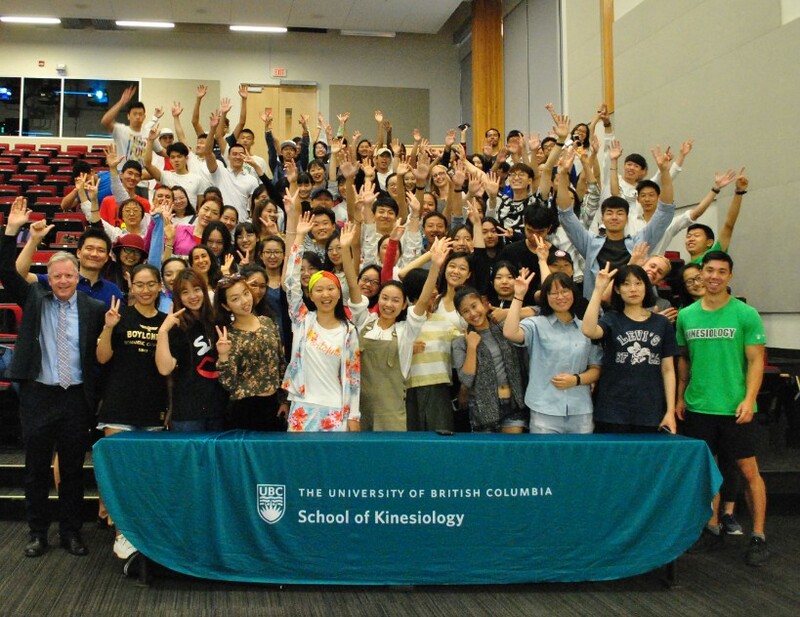 Participating universities should contact the School of Kinesiology of their interest in the summer program well in advance so that accommodation, instructors and all other details can be organized. If you'd like to inquire further, please fill out the form under the Contact Us tab. 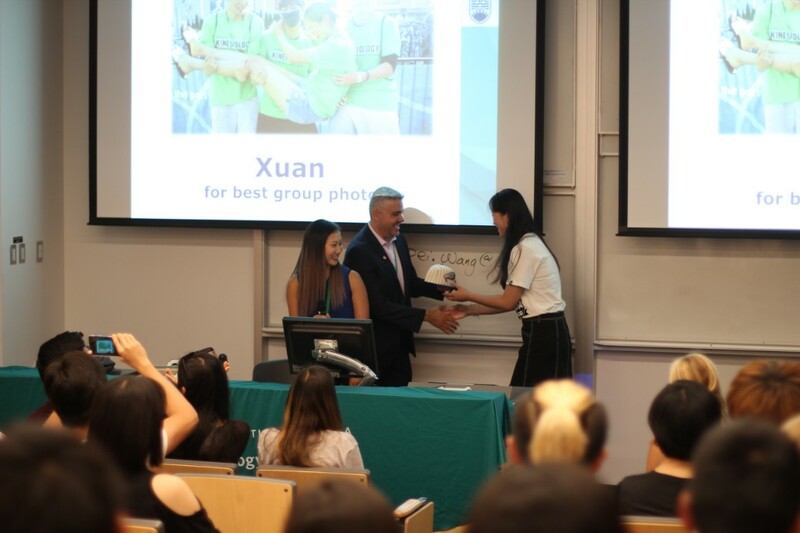 The program includes a city tour, welcome and farewell luncheons, and many academic and social activities. Academic and some social activities are included in the program fee while others are subsidized. 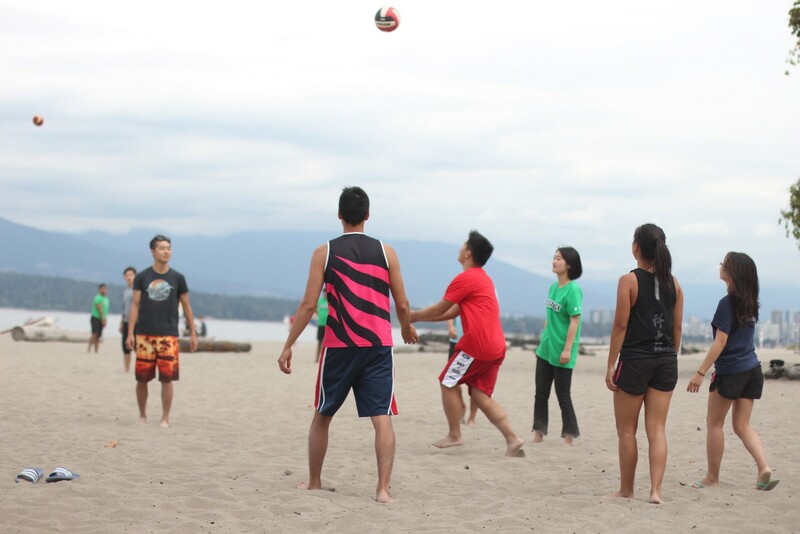 Activities may include visits to museums and Vancouver tourist attractions, outdoor activities such as dragon-boating and beach BBQ, attending sporting events, as well as weekend or day trips to Whistler, Victoria and the Rocky Mountains. The students are learning the anatomy of the upper body with models of the muscular system. Exercise physiology labs are part of the Clinical Kinesiology Package. The students are learning how to use the body’s core effectively when training different muscle groups. The instructor is correcting the student’s form and body position. 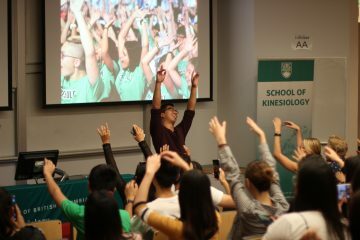 The students are showing their Kinesiology spirit by doing a cheer. 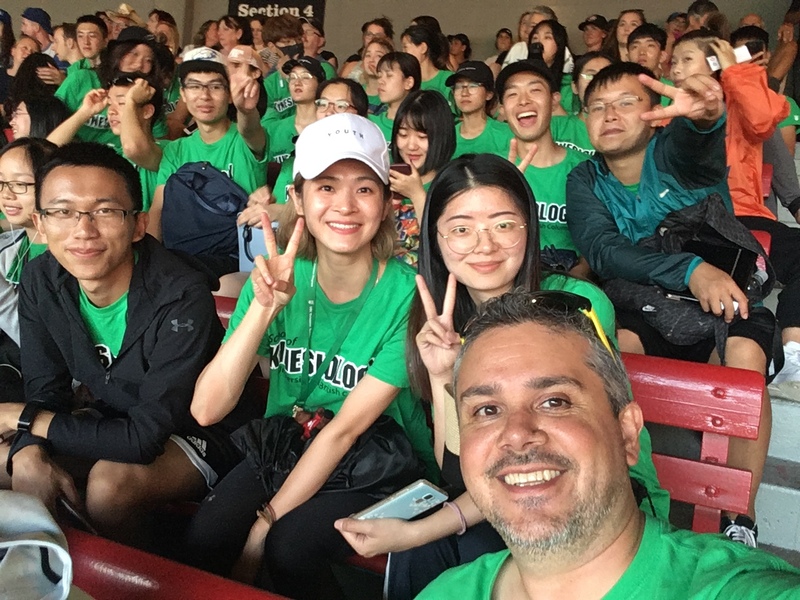 The Welcome Dinner is a large event, attended by students from all faculties participating in the Vancouver Summer Program. The students are listening attentively as graduate students doing their Masters or PhD in Kinesiology share their research. The students are playing a number of different field sports while learning the foundations of coaching. The baseball coach is teaching the students how to catch. 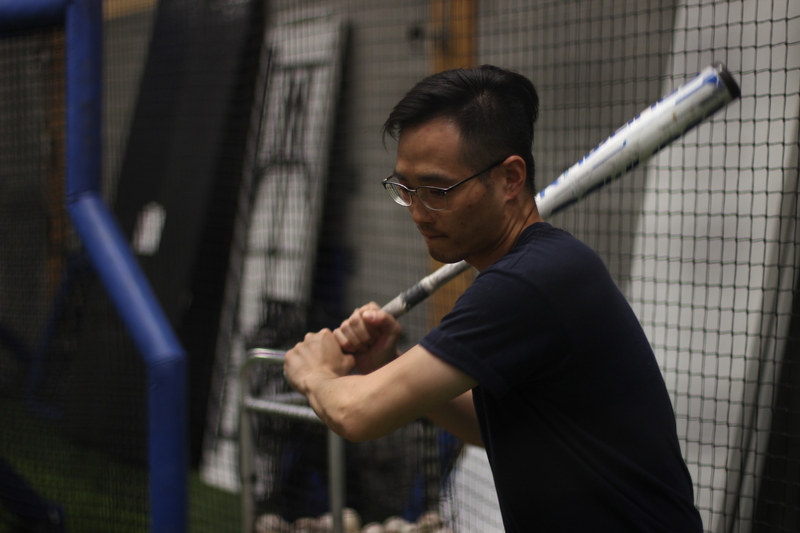 The indoor training centre contains batting cages, pitching machines, and HitTrax data capture and simulation systems. The students are working as a team to overcome the challenge ropes course. 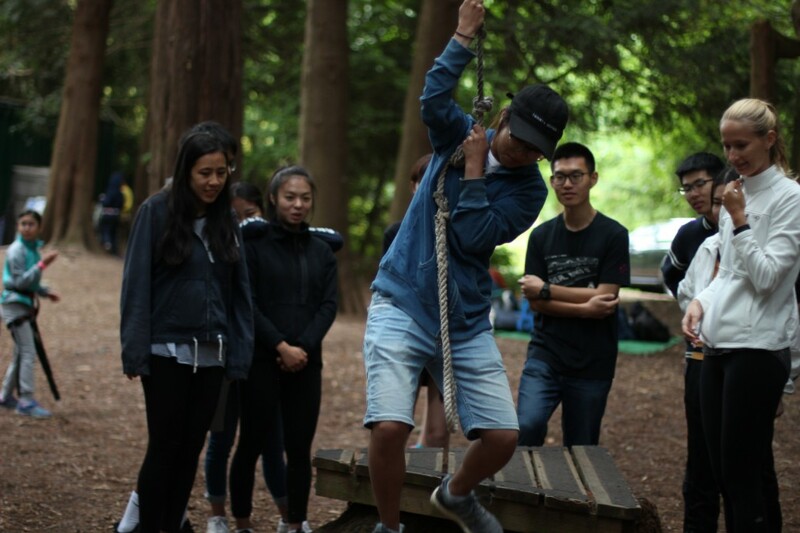 The ropes course is located on UBC campus and is comprised of 20 high elements and many low challenges. 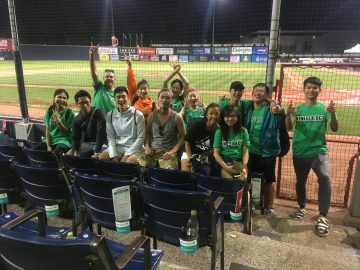 The students are watching the Vancouver Canadians play baseball at the Nat Bailey Stadium. The Vancouver Canadians are a Minor League baseball team based in Vancouver, British Columbia. The students went on a tour of Rogers Arena, home to the Vancouver Canucks hockey team. 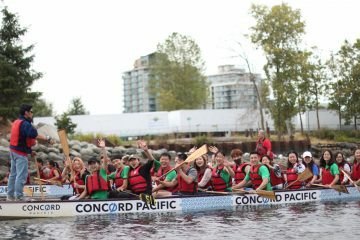 The students had the chance to try dragon boating in the beautiful waters of False Creek. 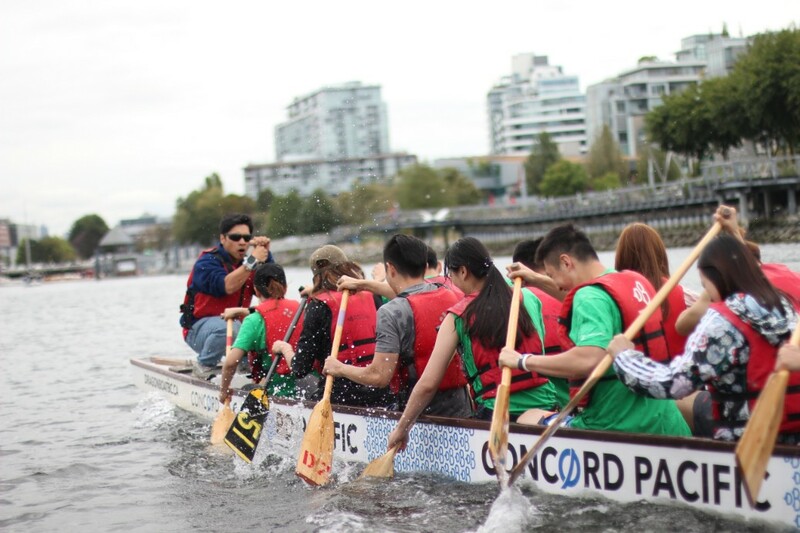 After learning how to paddle through a series of drills, the students on each of the three boats raced each other. 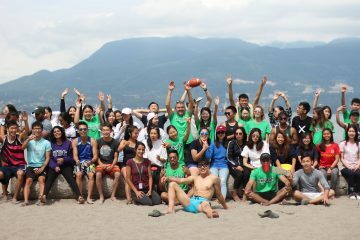 The students spent the afternoon at Locarno beach, starting with a barbecue lunch, and ending with different activities and sports on the sand. Some students even went for a swim! The students are giving one final kin cheer at their graduation day, led by one of the student ambassadors. 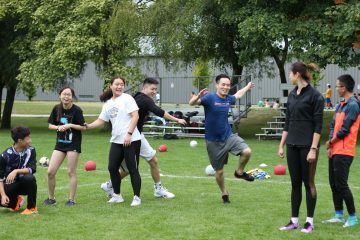 This marks the end of their time with the Kinesiology Vancouver Summer Program. 210 – 6081 University Blvd. 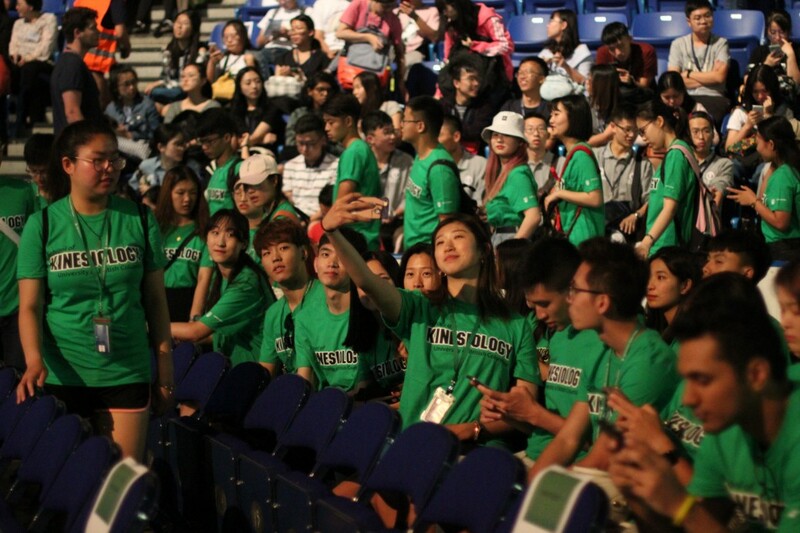 International Undergraduate Students Are you a prospective international undergraduate student? If so, please visit the Admission Requirements section of our Prospective Undergraduate page.